This Whole30 healthy zuppa toscana is rich and creamy, spicy, and absolutely bursting with flavor. You’ll love this filling, Whole30 soup anytime, but especially during cold, wintry months. Dairy free, gluten free, grain free, and sugar free, this is one of the best Whole30 soups out there and my favorite healthy soup! 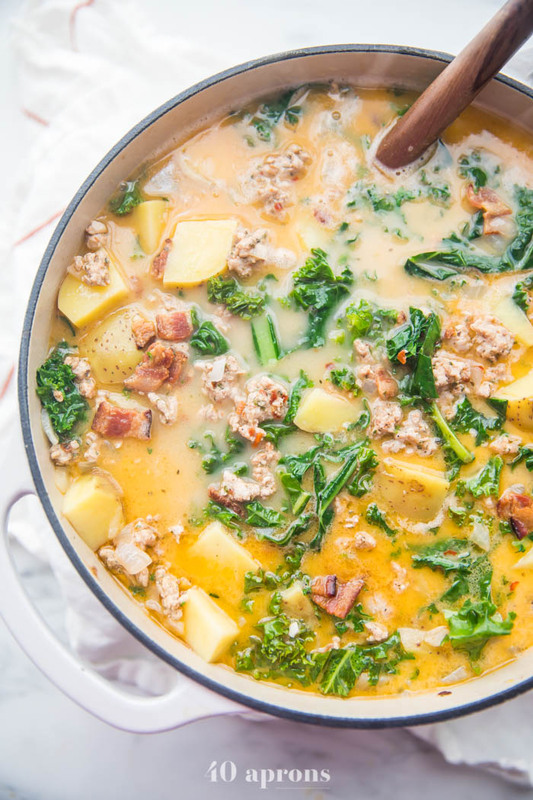 A rich, creamy, filling zuppa toscana that's healthy and Whole30. With tender potatoes, kale, easy homemade Italian sausage, and bacon, this Whole30 soup recipe is loaded with flavor and the perfect one-pot meal. Pour the chicken broth into the Dutch oven with the onions and garlic, and bring to a boil over high heat. Add the potatoes, and boil until fork tender, about 10-20 minutes. Reduce the heat to medium and stir in the coconut milk and the cooked sausage; heat through. Add the bacon and the kale into the soup just before serving and cook 'til the kale is bright green and softened. Add salt and pepper to taste. 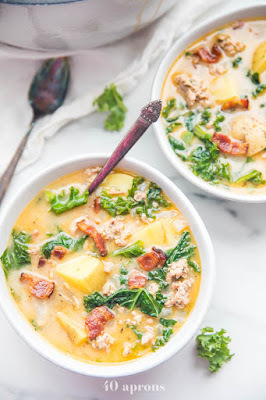 0 Response to "Healthy Zuppa Toscana (Whole30, Paleo, Dairy Free)"